A computer, properly trained, can be one of man's best friends. Friends Don’t Let Friends Use XP! itcat101	Chew On This, Security	Comments Off on Friends Don’t Let Friends Use XP! 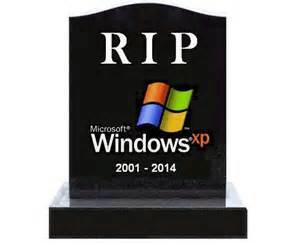 I posted the information, not to eulogize Microsoft’s most successful operating system, but to provide a very critical head’s up to everyone using the XP operating system – that they MUST properly prepare a RIP for XP and replace it prior to this coming April. I’ve made it my mission to tell everyone – friends, family, the world – that they MUST, not Should, but MUST replace XP. And I am asking you to join me in that mission – to tell everyone you know, including yourself, that XP has to be replaced. Friends will NOT let friends use XP! Unfortunately, as I’ve trumpeted my XP Retirement Call to everyone I know, I’ve found that way too many people think that retiring (referred to as sunsetting) XP is just a benign marketing ploy by Microsoft to make more money – that it is not truly a security threat. Please get rid of that notion! It is a delusional, risky thought. Yes, retiring or sunsetting a product is a way for the vendor to make money by forcing you to get the newest version of a product. But – NO, it is a major mistake for anyone to dismiss the threat aspect of sunsetting a product. The hard and cold problem of sunsetting any product is that there will be no more protective patches and updates provided for that product. Without updates and patches, all products, including XP, become willful invitations to be violated and exploited. Here are a few dangerous delusions and myths that are being used to justify continuing the use of XP. o Vulnerabilities from outdated operating systems are NOT protected or “healed” by even up to best up-to-date anti-virus or malware programs! o Hacker programs are constantly searching the internet for unprotected and vulnerable computers. It can take as little as 20 seconds to be discovered and hacked. In case being hacked doesn’t sound like much danger to you, think identity theft and all the horrors that go with it. Another danger is becoming enlisted in botnets. If you don’t know what a botnet is and why it is dangerous, see my post https://doggonecomputers.wordpress.com/2013/06/27/botnets-zombie-armies-what-the-hack-are-they-and-why-should-i-care/. I will end this post the same way I ended my previous post about retiring Windows XP: By not upgrading to a current operating system now or at least planning to pull your XP system offline by April 14, 2014, you are actually abetting cyber-crime. Please consider the consequences as very serious before you choose to ignore the XP support end date. Please do not do nothing…. Be a Friend and Don’t Let Your Friends Use XP! Don’t Buy a Used Cell Phone! Are You Now A Crime Target? Clear Text – Why You Should Be Clear About It!